In Midtown Tulsa, one block north of the popular Cherry Street District, sits Trenton Terrace Apartments, a small 8 unit building with personality plus! Enjoy coming home to your comfortable one bedroom one bath apartment home that offers affordable living. Our residents love living in the Cherry Street and Utica Square area which adds to their vibrant lifestyle. With easy access to the Broken Arrow Expressway, downtown Tulsa is a mere 5-6 minute drive. Each one bedroom, one bathroom apartment boasts large walk-in closets and built-in’s which provide plenty of extra storage, updated kitchens as well as private parking and locked mailboxes. Residents enjoy Shopping, nightlife and a variety of restaurants are within walking distance to Cherry Street. 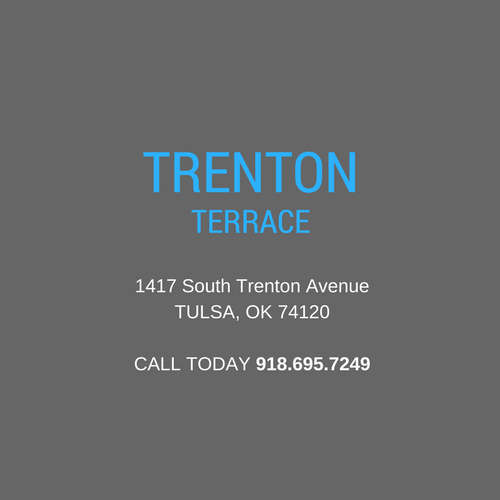 Call us today for a tour and discover why the apartments at Trenton Terrace in Midtown Tulsa is a great place to call home. Enjoy coming home to your perfect one bedroom one bath apartment home that offers only the best of lifestyle conveniences. Walk-in closets help keep you organized and updated kitchens make it easy for you to entertain. You will loving living in the Cherry Street area which contributes so much to your vibrant lifestyle. If you would like to schedule a tour of your new one bedroom apartment home in Tulsa, please click here!